After a frenzied 45 minutes at the gigantic Flemington Fruit & Vegetable Markets Sydney, at the weekend. Our household was overrun with an array of vegetables. As usual we had gotten overwhelmed by the excitement of it all and forgotten that two people simply can’t eat the same as a family of 20. So, the dilemma of the day today was what can I do with a bag full of mini eggplants (which incidentally cost me only $2! Bargain.) The answer a lovely Sarawak curry using chillies and lemongrass. Which also part answered my question, what can I do with a bag of chillies and 10 lemon grass?. Delicious! To make the paste: In a food processor or with a hand held blender grind the chillies, garlic, shallots, ginger and lemongrass to form a thick paste. Add the fish sauce and mix well. 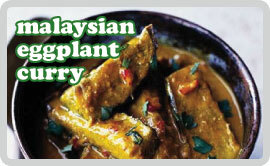 Mix the turmeric and chilli powder together and rub all over the eggplant pieces and set aside. Heat the oil in a large heavy pan or wok over a medium heat. Add the spice paste and the lemon grass. Stir for about 10 seconds, then add the eggplant pieces and stir until lightly browned. Pour in the coconut milk and gently bring to the boil. Let it simmer gently for about 15 minutes or until the eggplant is tender but not mushy. Remove from the heat and season with salt & pepper to your taste. With plain jasmine rice and a sprinkling of coriander if you feel inclined. And, if like me you’re looking to rid yourself of some fresh chillies, then deseed 2 red cayenne peppers, and chip into thin slithers and sprinkle over for an extra bit of heat.